Why am I willing to make these trade-offs for CloudKit, despite it’s limitations? Because, ultimately, developer perspectives aside, I felt it was the right choice for my customers. They will not need to setup another account with yet another set of credentials to manage. More importantly, their data will be stored with Apple, a vendor they have already choosen to trust. It will be stored in siloed, private data stores that not even the developer can access. That cannot be said for apps using Azure, Parse or other backend services. As Greg pointed out, CloudKit holds a lot of potential benefit for users as well as developers. On the other hand, users won’t see much of that benefit if few developers adopt it. Hopefully Apple has (or will) strike the right balance so that we all reap the rewards. How long will this service be around? How difficult would it be to move? How much of this service’s unique features do I use? How much benefit do I get from those? This extends to software, too. What is a given package’s reputation for security? Is it likely to be maintained in the future? Will upgrading to get a security fix also mean revising some of my code? That got me thinking about how CloudKit fits into this picture. As an iOS developer, CloudKit is immensely appealing at first glance. The API is low-level enough that you have a good deal of control over how your app interacts with the server. At the same time, you get a lot of server-side functionality for free, which leaves you with more time to focus on building a great app. But I still have a lot of misgivings about it. I’m going to go through some of Brent’s questions with regard to CloudKit, changing the order a bit here and there when it makes sense. How long will it be around? Is it likely to be maintained in the future? I have to say this is an area where I don’t have a lot of confidence in CloudKit. Although Apple’s cloud services have improved somewhat over time, they’ve also gone through a lot of incarnations. Moreover, Apple has a tendency to lose focus on products that aren’t a huge success, and encourages developers to move to the latest and greatest tech. If CloudKit isn’t a big success, I’m not confident that Apple will continue to pour resources into improving it. Past experience leads me to worry that they’d spend more time building a replacement system and promoting it to developers. What is a given package’s reputation for security? This is a strong point for Apple. Although CloudKit is a new product, both security and privacy are clearly important to the company. No system is completely secure, but I don’t have any more concerns about security in CloudKit than I would with Azure or any other competing service. Will this service and and those software packages allow room for growth? This is a tough question to answer. CloudKit is a fairly opaque box in terms of implementation, so it’s difficult to say how well it would scale. Apple clearly has vast resources at its disposal if it chooses to use them, but the fact remains that developers probably won’t get a whole lot of information about how CloudKit scales. It’ll either scale without us having to do anything, or it won’t. Even the storage and data transfer limits are unclear beyond the free tier. The documentation lists the usage you get for free with each app and additional user, but then simply says, “If you need more capacity than the limits listed above, contact us.” That’s hard to plan for. How difficult would it be to move? For me, this is the killer. As it stands now, it seems that it would be incredibly hard to move a CloudKit-based app to another platform. There is simply no obvious way to move data en mass from CloudKit to any other service. Maybe this is possible and Apple just hasn’t discussed it publicly, but as a developer, I need more certainty than that. Maybe CloudKit will work wonderfully for many years to come. But maybe it won’t, or maybe I’ll eventually want to do something that CloudKit doesn’t support. For those and a host of other reasons, I can’t imagine building critical aspects of my app around a service that doesn’t let me have a backup plan. Brent talks a bit in his post about choosing Azure for Vesper. Of course, CloudKit wasn’t available when they were adding sync to Vesper, but I imagine the decision would have been the same regardless. CloudKit sounds like a great option for some kind of incidental feature, but not for anything central to the app experience. A few weeks ago, I decided to pull my Metro app, Tunnels DC, from the App Store. After almost four years in the store, I thought it might be interesting to do a bit of a retrospectve on the app, what worked, what didn’t, and why I eventually removed it from sale. 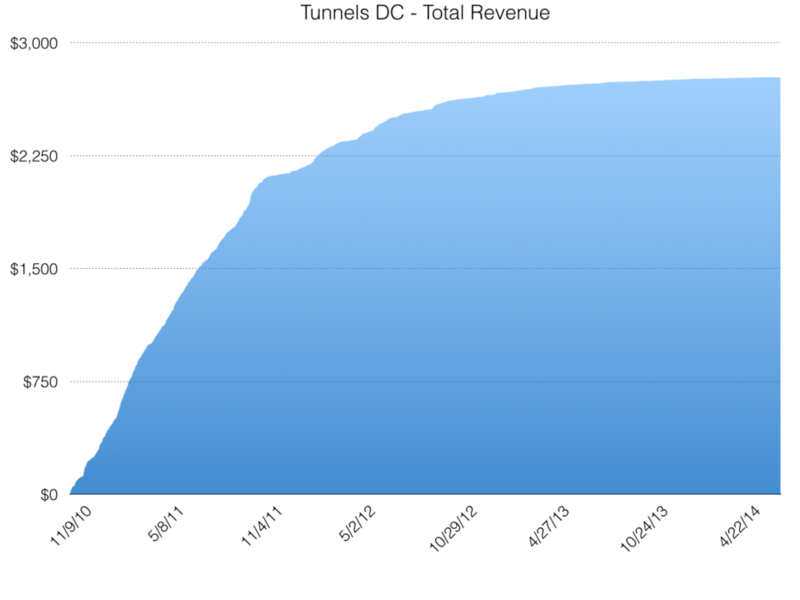 Tunnels DC debuted on the App Store on November 9, 2010. I’d recently left a job, which gave me the extra hours I needed to finish the project after tinkering with it in my spare time. Back then I was commuting daily on the Metro, and although there were other apps that purported to show train arrival times, few were using Metro’s then-new API. Many of the other apps in the category also lacked much design polish. I felt that there was an opportunity for success with a well-designed app backed by official API data from WMATA itself. 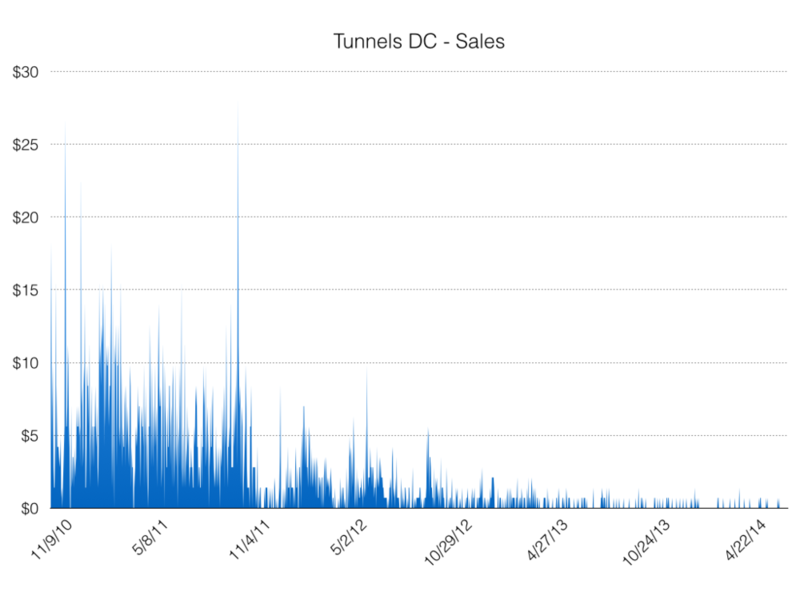 Unfortunately, Tunnels DC was never the commercial success I hoped it would be. Although I certainly didn’t expect to be making a full-time living off the app, I hoped that it would generate better sales than it did. Below are some charts showing the app’s revenue over time. As you can see, the app’s best year was by far its first. After that, sales tailed off significantly. Even in the first year, the best sales days totaled less than $30. Most days were closer to $1-2. By the end of the app’s life, most days had no sales at all. This is probably the biggest reason the app wasn’t a success. In an increasingly crowded category, there just wasn’t much to set Tunnels DC apart. It wasn’t long before most apps were using the official API. Some supplemented that with additional data that wasn’t publicly available. Others clearly had very strong design teams working on them. Finally, a few apps were backed by large companies that could afford to promote their apps heavily. For example, DC Rider is published by the Washington Post, which is conveniently able to promote the app in their newspapers. I wanted the app to pull its own weight. Although Tunnels DC never made a ton of money, it at least covered the annual cost of an iOS Developer Program membership that allowed it to be in the App Store. If the app were free, I’d be paying out of my own pocket to get it out into the world. I didn’t want to put ads in the app. I hate using apps with ads and would much rather pay a buck or two to get an app without them. Moreover, I wasn’t confident that ads would generate much revenue, even if app downloads increased somewhat. I guessed that a free app would come with increased support demands. I’ve heard a lot of developers talk about how free apps generate more negative reviews on the App Store, and more email from people demanding new or different features. I figured I’d rather stick to a low-priced paid app, even if it meant fewer downloads. By its nature, Tunnels DC is only useful if you’re in the Washington, DC metro area. There’s no real reason for someone who lives elsewhere to buy the app. As such, the pool of people who might even consider buying the app is relatively small. Given the app’s modest download numbers, I hesitated to put a lot of time into adding features. Realistically, it’s unlikely I would have gotten a very good return on my time investment. If I’m being honest, I also didn’t have a ton of ideas for ways to expand on the concept. In such a highly competitve app market, I needed to come up with a good way to differentiate my app from others. Since I failed to come up with strong new feature ideas, I decided to spend my time elsewhere. Ultimately, my decision to pull the app from the App store was a result of poor sales numbers. By this summer, downloads had decreased so much that the app didn’t seem worth even the minimal level of support it required. I was also given a push by the start of service on Metro’s new Silver Line. As the Silver Line launch date approached, it was unclear that the API would support it. A tip from someone familiar with the situation confirmed my suspicion that the API is not high on WMATA’s list of priorities. Although the API did eventually gain support for Silver Live trains, the uncertainty surrounding it was enough to tip the scales in favor of removing Tunnels DC from sale. Although I’d almost certainly have done so sooner or later in any event, the issue with data reliability served as a prompt to pull the trigger. Pick a good market. Make sure it’s big enough to support sustained app sales. Have strong features that set your app apart. This seems obvious in retrospect, but I think it’s an easy trap to fall into. The more crowded the category, the more the app needs to differentiate itself from the competition. I have a couple of app ideas in the works, so there should be an opportunity to put these lessons into practice sooner rather than later. Stay tuned.